This is a standard PDE setting which now applies to OT-specific compiler options, too. Also a new icon for the "New method()" entry was introduced. As the result you will see two new callout bindings (get and set) to the same field. If only a getter or only a setter was intended simply remove the undesired binding. When a quickfix is used for creating a precedence declaration that affects after callin bindings, the quickfix automatically creates the declaration as precedence after (see also the change of OTJLD §4.8(a) described here). 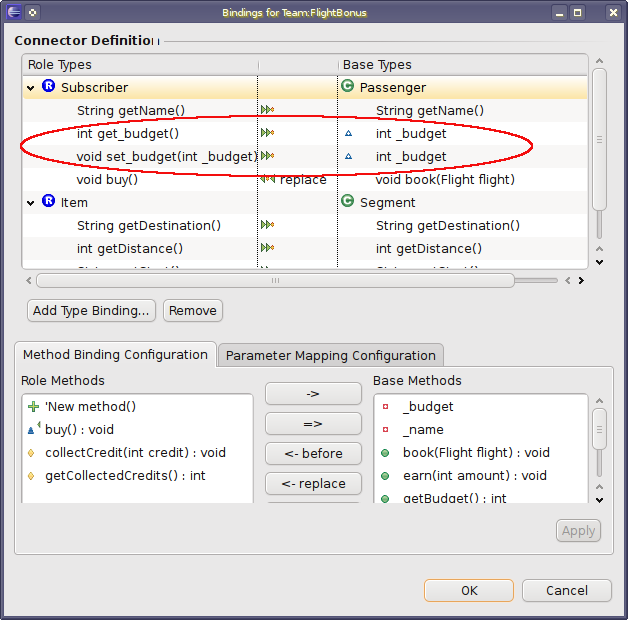 The quick assist for removing signatures is disabled if argument names are used either in a parameter mapping or a guard predicate. The new role implicitly inherits all properties from the inherited role Bonus.Subscriber (OTJLD §1.3.1(c)) and may override methods and/or refine extends (OTJLD §1.3.2(b)) and playedBy (OTJLD §2.1(c)) relationships. 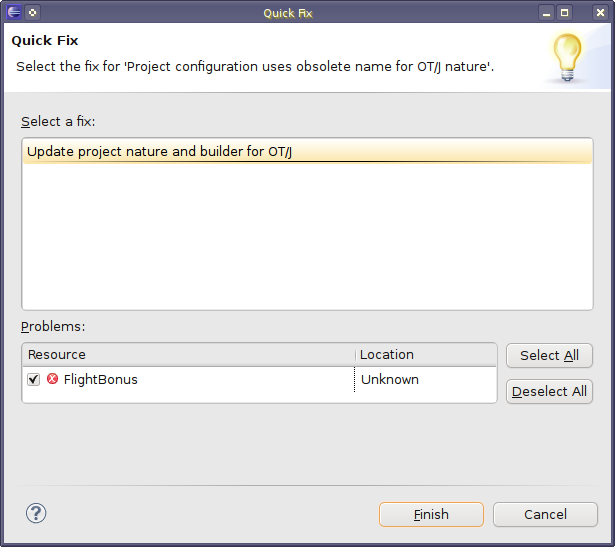 Previous versions of the OTDT featured two alternative strategies for launching OT/J applications: JMangler and JPLIS. 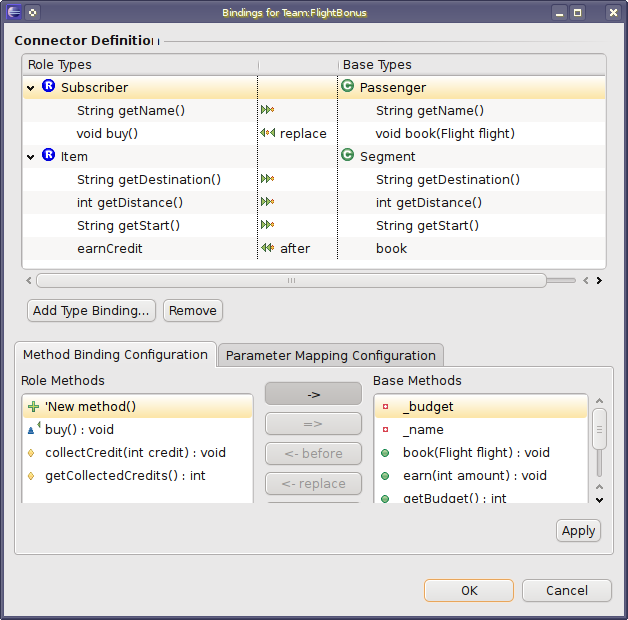 During the move to Eclipse.org, the support for JMangler was discontinued because the JPLIS launch mode has long matured and bringing JMangler to Eclipse.org would have caused additional license issues. Also note the similarity to the synthetic field this$0 which refers to the enclosing (team) instance. Serializable teams must invoke this method once from their readObject() method in order to re-initialize internal data structures. Serializable teams must invoke this method from their readObject() method for each role that has been retrieved and shall be re-registered for this team. If a serializable team wishes to persist its global activation status it must call this method from its writeObject() method and correspondingly call readGlobalActivationState(ObjectInputStream) from its readObject(). If a serializable team wishes to persist its global activation status it must call this method from its readObject() method and correspondingly call writeGlobalActivationState(ObjectOutputStream) from its writeObject(). If a team is restored that was globally active when serialized, it will be activated correspondingly during deserialization when this method is called. 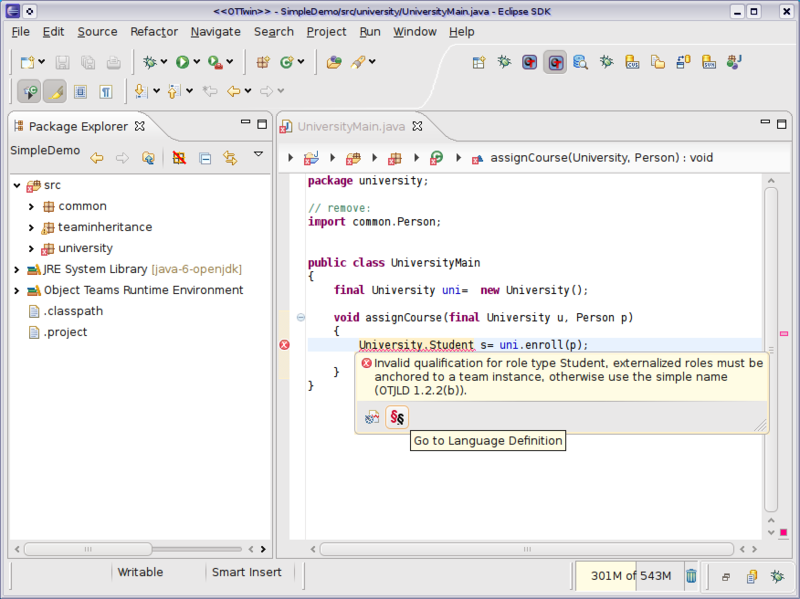 The semantics of how exactly a precedence declaration should affect after callin bindings was underspecified in the OTJLD and the OTRE implemented unintended semantics. for before and replace bindings a high precedence (i.e., being listed early) means early triggering, but for after bindings a high precedence means late triggering. require precedence declarations which affect after bindings to make this fact explicit by using precedence after instead of just precedence. The new semantics have been implemented in the OTRE accordingly (see also the corresponding quickfix). Here the C3 algorithm could produce two different orders (bl1, bl3, bl2) or (bl1, bl2, bl3) (both order are consistent with the input lists). Which order is chosen depends on in which order the two precedence lists are passed into the algorithm. To fix these issues OTJLD §4.8(d) has been extended to specify that more deeply nested precedence declarations have higher priority than outer precedence declarations. So in the above example the final order of callin bindings will be: (bl1, bl2, bl3), because bl2 is mentioned in the inner precedence declaration and thus comes before bl3 which is mentioned only in the outer precedence declaration. The compiler has been updated accordingly. Callin mapping not allowed here, because lifting to role TX.RY is not possible due to a reported binding ambiguity (OTJLD 4.1(b)). the actual base object has a type for which a specific role without binding ambiguity exists. The compiler message has been rephrased in a weaker way. A new warning token "def-bind-ambiguity" (definite binding ambiguity) has been introduced which can be used in a @SuppressWarnings annotation in order to silence that error. 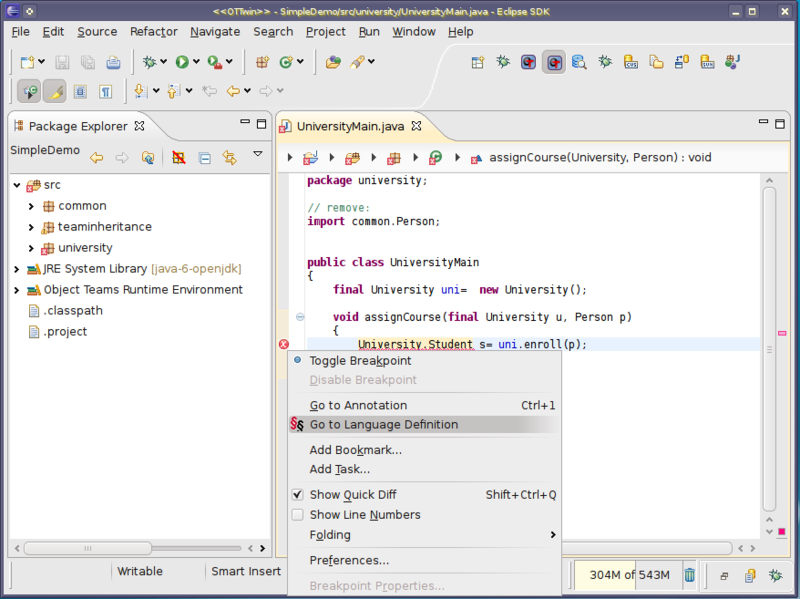 Additionally, option Suppress optional errors with '@SuppressWarnings' must be enabled in the Java Compiler preferences. The generated lift method has been changed to service case (1) above. 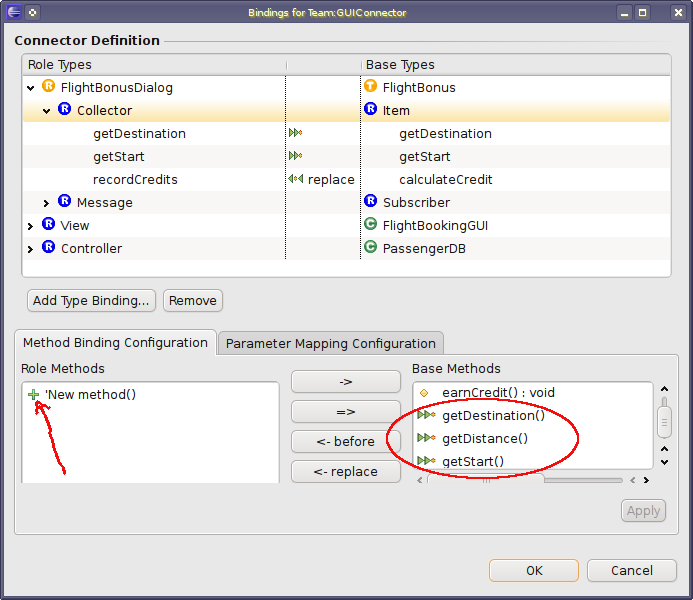 In an after callin binding where both methods declare a return type, users might expect the role method's result to be passed down to the original caller. However, after callin bindings may only look at the base method's result but never replace it with its own result. In order to alert users of this issue, a new warning has been introduced. If desired the warning can be suppressed using the token "ignoredresult"
Previously, aspect bindings for nested teams could only be specified by using the internal name involving an ugly "$__OT__" prefix. Specifically, when selecting a nested team using the Browse button the resulting declaration would not work. will be understood by the OT/Equinox runtime. The recently introduced concept of a lifting participant is now supported also within OT/Equinox. 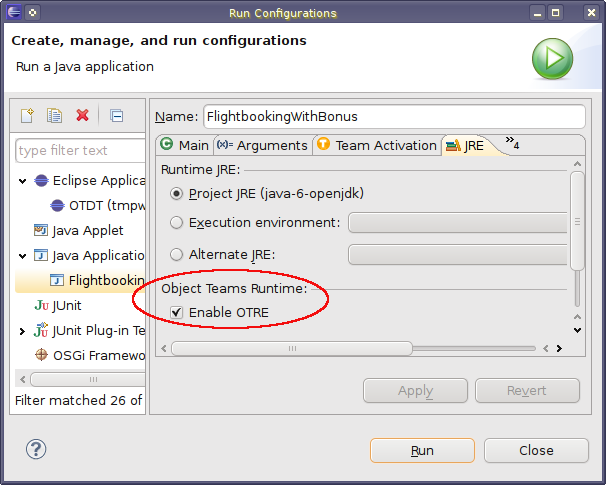 This is done using the new extension point org.eclipse.objectteams.otequinox.liftingParticipant. In any application at most one extension to this extension point is allowed. The extension must provide a class implementing org.objectteams.ILiftingParticipant. Warning: Deactivation for the AWT-Event-Thread is not effective right now! This problem could be resolved and the workaround is no longer used.